A bathroom remodel is a thrilling experience for a trade pro and their customer. The entire project usually pivots from a few features: the sink, the floor, the tub or shower, and the countertop. The ProSource® of Naperville showroom staff and experts are ready to help you and your customers find the best wholesale prices on the highest quality product in the industry. If you’re working on a remodeling project, visit us and get started today! 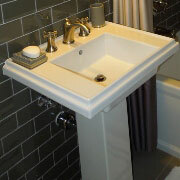 When choosing the best bathroom sink for your remodel project, consider the sink style, type, and color. You will find shroud, vessel, and pedestal types in various colors so you and your customer can find the best sink for their bathroom remodel. After you choose your bathroom sink, you’ll want to consider which type of faucet you want. Our design experts at ProSource can assist in deciding on a standard bathroom faucet or a stylish, curved bathroom faucet. 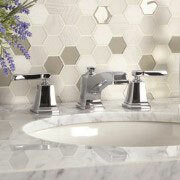 Whether you want a classic, traditional, or modern faucet, we can help! A comfortable, inviting shower is important to any bathroom. We all use a shower to get clean and ponder our thoughts, so it’s important the shower remodel supports your customer’s needs. Whether they want a head only, head and faucet, or a head, faucet, and handle is entirely up to them. Our vast showroom will provide the highest quality products for you and your customer’s project. When we think of bathroom storage, it tends to be limited. But what if you could add extra storage without taking up more room? 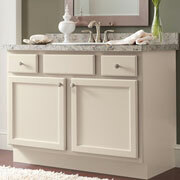 Bathroom vanities are a great option to add storage, counter space, lights, and a mirror while enhancing the space. 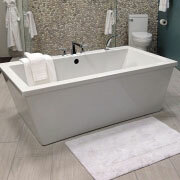 Our Naperville showroom provides an easy way to choose the best bathtub option for your customer’s remodel project. Whether you want to install a standard tub or go for the jacuzzi upgrade, we can help. 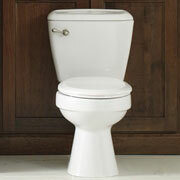 If you’re looking for new toilets, you will find plenty at ProSource of Naperville. Our vast assortment of toilets gives you and your customer the ability to choose the best “throne” for the bathroom remodel project.